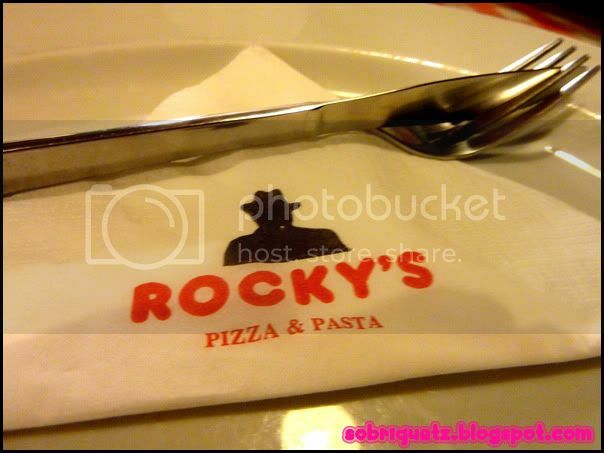 ...finding colours, love and you ♥ `: Rocky's Pizza - it's really HUGE! Rocky's Pizza - it's really HUGE! After MKT3412 meeting on 6th September on a cold and wet Monday, wy, gh and I headed to Sunset Way for dinner. Sunset Way is fast becoming my favourite place ever since going there a few days ago for Buttercake N Cream. Sunset Way is just sort of a peaceful sanctuary, with good food, good ambience, not many people - i like! Places like Orchard are just overflowing with too many people! This was also a place that gh has been before, where he said the pizza was really uber huge! So we went to see for ourselves. We were quite pathetic actually, because it was super cold, we chose to sit outside. And since it was quite late, there wasn't many people around. So we looked like 3 pathetic souls, eating under a tiny umbrella :s sadness, haha. In fact, wy even on music on his laptop just to have more ambience... omg, we are freaking pathetic! They placed two circles inside the restaurant so that you can gauge how big it is. But pls don't trust it - I think it's because of parallax error that you think that the 12" seems small. But, it is huge la (look at picture below). According to gh, the XLarge one is really huge such that it almost fills the table! 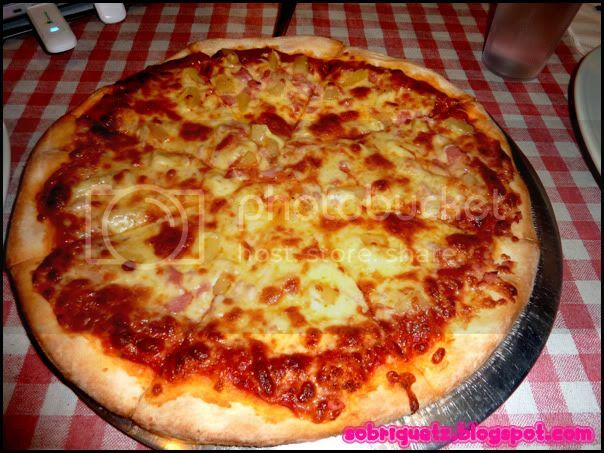 There are fixed type of pizzas like hawaiian and such, but you can also choose to customize your pizza with the toppings that you want. Being tired, hungry and totally boring, we chose Hawaiian - cos i like la, hahaha! yes, i'm boring... SO!